In the plot of the first version (Brazilian version), you can see the Santa Marta in Rio De Janeiro and some inhabitants, and Jackson sings together with the inhabitants the song. 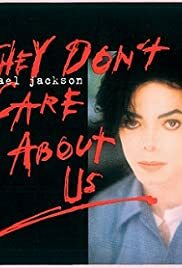 Michael Jackson and Janet Jackson star in this short-film to spread awareness on the media's constant slander on various artists. The music video shows a smiling Jackson in a black and white tuxedo with a black bow tie dancing and singing the song while appearing chroma keyed over a background of abstract geometric figures. A promotional video for Michael Jackson's 1983 hit single "Beat It." This second version was filmed in a prison with cell mates; in the video Jackson is seen handcuffed. It also contains real footage of police attacking African Americans, the military crackdown of the protest in the Tiananmen Square, the Ku Klux Klan, war crimes, genocide, execution, martial law, and other human rights abuses. Masterpiece. Nothing like it. Should be watched by everyone everyday. One of the best pieces of cinema ever. God level. Great song, dancing, directing and message. All around fantastic.